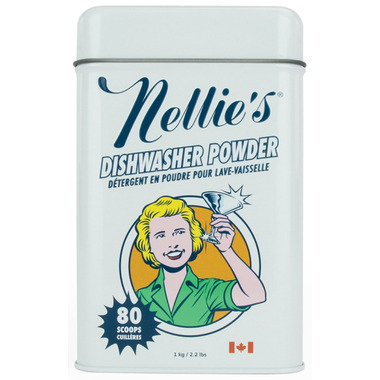 Nellie's Automatic Dishwasher Powder takes care of grease and baked-on food, leaving dishes clean and spotless. It's also biodegradable and phosphate-free, which means no peculiar tastes and odours are left on your dishes. This powder is pretty good--only one item didn't come clean upon the first use. Since then, it's doing the trick. It's the 4th Nellie's product I've purchased and I really like them all. This stuff definitely seems to do the trick in my dishwasher! Really happy with it and love Nellie's as a company. This works the absolute best in my ancient, apartment dishwasher without being harsh- I noticed the other natural brand I was using was causing the finish on plates to wear off. I've been using this one for maybe a year now and it's been great. The laundry soap is tops, too. I am in love with Nellies!!! We try to have less harsh chemicals at home. I love that everything comes out from the dishwasher super clean!! Just like the chemical ones. Love that is a green and Canadian product. Great product. I continue to reorder from well as it often goes on sale. Our dishwasher is older so a pre rinse is required but I love that it doesn't smell like harsh chemicals when I open the door. Love this dishwasher soap, cleans the dishes great. Occasionally if we don't run hot water from the sink tap dishes won't get as clean but for the most part it works great! I really wanted to love this product, but it just does not do a good enough job to love it. We used it as directed for a full month and have a relatively new higher-end dishwasher. Dishes do not come out nearly as clean as with a standard detergent, even with pre-rinsing. I am so disappointed. I love this product. Wash the dishes and also wash the dishwasher in the aame time. No more odor comes from it. I had some difficulties with the rinse part but I had a rinser and there is no more troubles. Love this product, no strong scent and no strange film on the glasses. I find it cleans the dishes well. This is by far THE BEST dishwashing stuff I have come by. It works perfect every time. I ran out and had to use conventional dishwashing liquid and the stink of the fragrance was awful! I had forgotten how strong regular dishwashing liquid is. I am in love with this product. Good price, lasts a long time. Dishes need to be pre-rinsed, but otherwise things get squeaky clean. Love using a natural product to clean our dishes! My husband is not impressed. We have to use 2 scoops for it to work well. Great results! I have hard water and it still gives good results. Will keep purchasing. I love nellies products so decided to give this a try and I'm happy with the results. You don't need much for a good clean and it doesn't smell like harsh chemicals which I like. I love Nellie's products, however my dishes aren't cleaned as using other green dishwasher soups. I have to rerinse some dishes after, don't think I will purchase it again. Love it product. Doesn't smell, dishes are clean. Absolutely LOVE this detergent! I love all of Nellie's products... but this is my FAVOURITE! Love this brand. This powder does a good job and I'm happy that it is safe for the environment.